Early Morning (7 AM TO 9 AM): Most of the customers are workers heading toward midtown and Downtown, therefore taxicabs tends to pick up on the surrounding neighborhoods and drop off on Midtown and lower Manhattan. On this period Midtown is the easy spot to find a cab, while neighborhoods like Upper West side and Upper East side are most hard area to find one. East Village and West Village are less affected. Upper West Side and Upper East Side: More chance to find empty taxis heading north, Avenues like Amsterdam, Central Park West, Madison, Park Ave, 3rd Ave are good spots to find a cab. On the Evening (4 PM To 6 PM):Off Duty Taxis: These cabs are likely going back to Garages for shift switch. Taxi drivers do face a stiff fines for been late on return time. These cabs might pick up a passenger if going the same direction as the taxi driver. Taxi driver must close his windows and lock his doors for protection. The passenger should look at this positively, It is a win win situation between the driver and the passenger, the driver can add up a few dollars while heading home, On the other hand, the passenger do get a ride where no cabs out there. It is recommended for the passenger to be cooperative with the driver and not to feel offended for refusal to pick up. The driver usually asks the passenger destination before unlocking the doors. The Four States of NYC Taxi, When to Hail a Cab? Taxicab medallion light is on, off duty light is off. Taxi driver is On Duty and ready for pick up. On rush hours and especially in the evening You see all kind of black cars and limos do illegal Pick ups. Cars from New York, New Jersey, Connecticut, and other states do take advantage of people and overcharge people usually triple the fare a NYC yellow taxi would cost you. 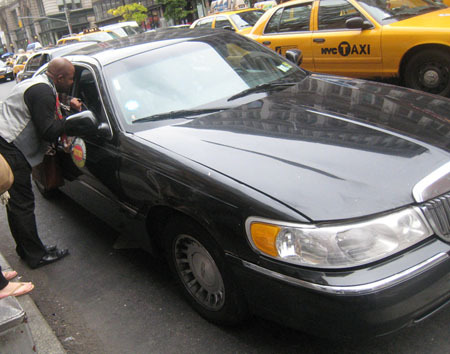 Tipping a cab driver is customary in New York City, but not mandatory. On average a driver does around 26 to 30 trip a day, therefore, Adding an extra dollar or two will help a lot improve driver revenue.